Secure your 2015 Installation and Awards Banquet sponsorship! Follow these tips to make sure you and your guests are safe and secure during the holiday season. The Annual Regions Chili Cook-off was held in conjunction with the 2016 General Elections last month. Check out the winning chili teams here; find 2016 HBAMT election winners in the January issue of The Nail. Youâ&#x20AC;&#x2122;re invited to the 2015 Installation and Awards Banquet at the Omni Thursday, December 17. Find pricing and RSVP details here. The Metro/Nashville and Williamson County Chapters held a joint meeting last month at the HBAMT offices. Joe Valley, standing, delivered a presentation about the services provided by Nashville Electric Service (NES) for those in attendance. Ray Khayatt from Coldwell Banker Barnes lead an expert panel in a discussion about cultural diversity at the Sales and Marketing Council’s May meeting. A big thanks to FirstBank and Coleman American Moving Services for sponsoring the meeting. An informative “Managing Emotional Home Owners” webinar was held May 6 at the HBAMT. The educational event was hosted and sponsored by the Remodelers Council. odest home price and interest rate increases resulted in a slight drop in nationwide housing affordability in the third quarter of 2015, according to the National Association of Home Builders/Wells Fargo Housing Opportunity Index (HOI) released today. “Attractive home prices and interest rates, along with firming job growth, are helping housing markets across the country to gradually improve,” said NAHB Chairman Tom Woods, a home builder from Blue Springs, Mo. “While this bodes well for housing in the coming year, builders continue to face challenges, including a lack of available lots and skilled labor.” “The decline in the index was slight and affordability remains good,” said NAHB Chief Economist David Crowe. “With mortgage rates near historic lows and home prices advancing at a modest pace, this is an excellent time to buy.” In all, 62.2 percent of new and existing homes sold between the beginning of July and end of September were affordable to families earning the U.S. median income of $65,800. This is down from the 63.2 percent of homes sold that were affordable to median-income earners in the second quarter. The national median home price increased slightly from $230,000 in the second quarter to $231,000 in the third quarter. the floor. Temporarily remove throw rugs, including bathroom mats to prevent guests from tripping on the edges. Test stair railings. Check that stair railings inside and out are tightly fastened. Make repairs where needed. Turn up the lights Put night lights in bathrooms, the guest bedroom, hallways and perhaps in the kitchen. Make sure there is a lamp or light switch within reach of the guest bed so that your visitor can keep a light on until safely tucked in. Well-lit outdoor walkways and entrances are also key for coming or going when it is dark. Clear outdoor walkways Rake leaves, salt for ice and shovel snow from sidewalks and driveways to prevent falls. Big winners at the Regions Chili Cook-off! HBAMT elections and cook-off draw big crowds at the HBAMT. Tim Ferguson congratulates Rick McCreadie and presents him with the first place “Judges’ Award” following the Chili Cook-off. Ferguson presents Jeremy Coop with Bellenfant & Associates “People’s Choice Award” following the Chili Cook-off. Ferguson with team members from third place winning Irving Materials, Inc.
Ferguson and Taylor Conlan, winner of the Regions Green Bike raffle. Robertson County RSVP line: 615-377-9651, ext. 313. 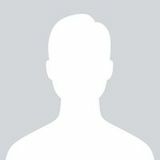 METRO/NASHVILLE CHAPTER Chapter President - John Whitaker: 615/843-3300. The Metro/Nashville Chapter meets on the fourth Monday of the month, 11:30 a.m.. Next meeting: to be announced. Builders free pending sponsorship. Price: $20 per person with RSVP ($25 w/o RSVP). Chapter RSVP Line: 615/377-9651, ext. 304 ROBERTSON COUNTY CHAPTER Next meeting: to be announced. HBAMT REMODELERS COUNCIL Council President - Ricky Scott. The HBAMT Remodelers Council meets on the third Wednesday of the month, 11:00 a.m. at varying locations. Next meeting: to be announced. Location: to be announced. Topic: to be announced. Price: free for RMC members with RSVP; $15 for non-members with RSVP ($20 w/o). Council RSVP Line: 615/377-9651, ext. 301 INFILL BUILDERS COUNCIL The Infill Builders meets on the third Thursday of the month, 11:30 a.m. at the HBAMT offices. Next meeting: to be announced. Price: Builders Free with RSVP pending sponsorship. RSVP: receptionist@hbamt.net or the Infill Builders Council RSVP Line - 615/377-9651, ext. 310. MIDDLE TENN SALES & MARKETING COUNCIL Council President - Derenda Sircy. The SMC meets on the first Thursday of the month, 9:00 a.m. at the HBAMT offices. Next meeting: to be announced. Topic: to be announced. Price: to be announced. Council RSVP Line: 615/377-9651, ext. 302. 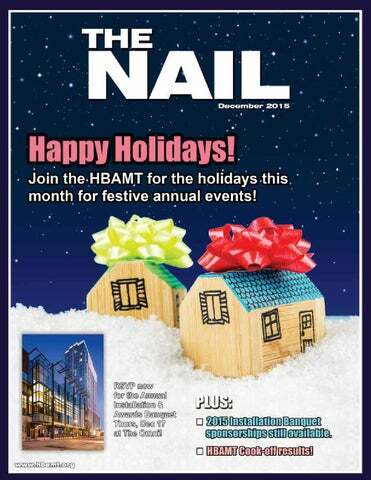 The December, 2015 issue of The Nail, the official monthly publication of the Home Builders Association of Middle Tennessee (HBAMT).